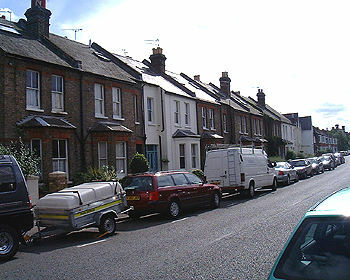 Much of Windsor's Victorian terraced housing was lost when Ward Royal was built in 1968-69. Demolished streets included Goswell Road, Grosvenor Place, Denmark Street, Edward Square, Sydney Place and much of Oxford Road. Fortunately we have a record of how the streets used to look when Norman Wisdom as the 'Wannabe' policeman Pitkin is pursued by hundreds of police through these long lost streets. On The Beat Location shots. A second film, Carry on Cabby has now been added here. The Royal Archives has references to people employed in the Royal Household from the 18th century, and indexes to names of people employed from 1660 onwards. Please put your enquiry in writing, including as much detail as possible, and send it to: The Royal Archives, Windsor Castle, Windsor, Berkshire SL4 1NJ. For earlier periods, contact the National Archives at Ruskin Avenue, Kew, Richmond, Surrey. TW9 4DU. We recently came across a Kelly's Directory of 1846 which features an extensive list of 'Gentry' and 'Traders' living and trading in the town in 1846. We shall shortly be creating a complete page to Sir Dhunjibhoy as he was a considerable benefactor to Windsor. New photographs taken at a variety of events at The Willows has come to light through the kindness of a contributor and we shall be featuring these extensively to provide an idea of the man, his times and his generosity towards Windsorians. As past residents (born and bred in Oakley Green and Fifield) of Windsor and Maidenhead area, and since taken up residence in Western Australia, I have a request which I hope you can fulfil. We lived on the Windsor Road which ran parallel to the Maidenhead Road. It is on the Maidenhead Road that we are debating. We of course were children at the time, and we used to walk through the Bridle Path alongside Homers Farm out to a residence known as the "Willows" which was situated more towards Bullocks Hatch Bridge end. The building we are interested in is practically opposite where the council in those days had it's rubbish tip. It used to display wrought iron gates with a crest of some sort with "DB" across what appeared to be a shield. This is all from memory, as it was some 60yrs ago. Subsequently the iron work was removed for melting down during the war so we never did see the full name. We are two separate families and remember the place well, but can only offer the phonetic version of which it was referred. This was pronounced as " DUNJY BOYS". As many names were changed to accommodate the English language, we were wondering if it was some foreign name as in De Bierre, which it was definitely not as there was a pronounced GEE in-between. Hoping you can help, and if we can be of any assistance in any history, we will oblige. Congratulations on the Web site, very informative, interesting and well presented. I have lots to tell you about the gates, not least that a great friend of mine, Phil Wells, now well into his retirement, recalls being taken past the gates on Sunday walks by his grandfather, who actually made them!! 'Grandfather' was a blacksmith in the 1930s for Windsor Corporation and also made the gates for the Parish Church at the top of the town, and other wrought iron items in Windsor. The house was Sutherland Grange. The surrounding land to the north (river side) of the Maidenhead - Windsor Road is probably much as you remember it although the road itself is now much wider. The rowing lake, Dorney Lake, is directly across the river. There is a housing estate on the other side, and Bullocks Hatch Bridge is now bypassed by the road improvement. The original road remains as a cul de sac past The Willows which is a residential caravan park. The original buildings at that point still remain. Across the road is The Willows Garden Centre. The gates to which you refer, if they were at the Bullocks Hatch Bridge have indeed gone, but a little way up the road another set of gates remain, those at the entrance to Sutherland Grange. Although the DB initials have been removed, it is just possible to see where they once were fixed. The main house and contents were auctioned in 1948 or so, and my father recalls buying a box of oddments which contained domestic bulbs. Not until he got the 'lot' home did he find out that they were 100 volt lamps and blew the moment they were switched on in a 240 volt circuit! However, also in the box was a set of chandelier crystals. This chandelier hangs to this day in our dining room, just downstairs from me as I write!! I think there are several other items in the house that were originally in DB's mansion. Sir Dunjiboy Bomanji's wife moved to Harrogate where she was a respected local resident. I recall my father telling me of the parties that would be held at the mansion, often for returning servicemen who went there in droves immediately after the First World War. Sir Dunjiboy was keen to be seen as very supportive to the British. 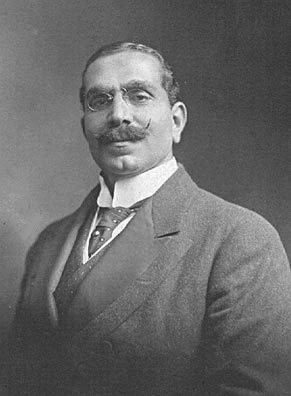 Was he a Maharajah? No, just a wealthy Bombay business man connected with the harbour and shipping. I met Lady Bomanji who was then in her late eighties. At the time I was contacted by her daughter who was very involved with the St John Ambulance and they wanted me to do a talk on Malta - an island with which I have been closely associated with since my teens. After the talk I was invited to Pineheath for dinner - quite a memorable event. Lady Bomanji was then (around 1979) a widow of many years so much of what I know is old news, but I was told Sir Dhunjibhoy had given £1,000,000 (a lot of money in those days) towards the war effort and his knighthood was in recognition that fact. Lady B told me they had a palace in India and had lived in a large house in Windsor when they came to England. She said the house was a home for many refugees and was sold at the end of the war when the building was split into three and purchased by barristers or stockbrokers. The house at Pineheath was unbelievable. A domed cupola was gilded; there was butler and the furnishings were fabulous. Lady B was a very generous lady who I remember gave me a large bottle of sherry to cheer myself up and also a pair of jubilee cuff links. She was, so a fellow guest told me, a Parsee who was expected to donate a portion of her wealth annually. Mrs Jehangir is I believe the daughter of Lady B and was at that time of my visit at least in her late fifties so she would now be in the region of eighty years old. The brothers had diverse business dealings, one operated a taxi business and there was also a restaurant which traded as "Oliver's". Sadly, I know one of the brothers died very suddenly, a heart attack I think. Many thanks indeed for your very prompt and informative reply regarding "DB". I apologise for the delay in answering, but, I don't know if you know anything about Australia, especially Western Australia. I live in Carnarvon on the Northwest coast, cyclone, flood and drought prone, while Ron lives in civilisation 1124miles away on the Southwest coast in Albany. The difference between chalk and cheese. Albany's rainfall is worse than England, where we in Carnarvon rely on summer rains with an average of 7inches per. year. I was very interested in the articles regarding the flood relief channel, as this is very much under discussion here in Carnarvon at the moment. Our river, the Gascoyne River, runs just as the Thames does at Windsor, alongside the town, normally with a dry bed for about 9-10months, Hence it's description in the books as the upside-down river. Due to cyclone Steve in March, it devastated the town and local plantations when the Gascoyne peaked at 29ft8in. This resulted in a rise of some 6ft above the bridge, which is the lifeline North to the iron ore and gas fields, South to Perth where our supplies come from, 600miles from us. If there is any interest in these things, perhaps we could keep the contact going, if not we'll let it go. The point of interest being the relief channel. Once again thanks for the information, I did not see any mention of Braywood CofE School, where we both attended, or the Braywood Church which I understand is now no longer there. I did manage to take a photo of the church, St. Barbara, covered in about 4or5ft of snow. This was in memory of when I was a choir boy, and mostly in memory of our turns at keeping the wind supplied to the organ (or lack of). 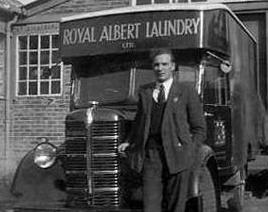 Joe Bourne drove for the Royal Albert Laundry for many years and his Bedford van would have been a common sight in the streets of Windsor. We are planning a story about the Royal Albert Laundry with the help of Joe Bourne's son Christopher. Windsor Forest Bowmen club captain was Bernard Mummery who lived in Kings Stable Street, Eton. He used to be the Royal Clock Winder at Windsor Castle. A similar position was featured at length in the BBC TV programme 'Queen's Castle' where one of Mr Mummery's successors was shown undertaking the major task of adjusting all the clocks at the Castle, and in and around the Great Park, when British Summer Time started. Samuel Wilkinson was on holiday in August 1902 and it happened to be Coronation Day so Samuel wrote a fascinating diary entry about the day in Windsor. In addition he wrote several other diary entries about the various day trips that he made by train while enjoying his holiday. The facsinating diary entries have been been transcribed by Jim Powrie, Samuel's great nephew. 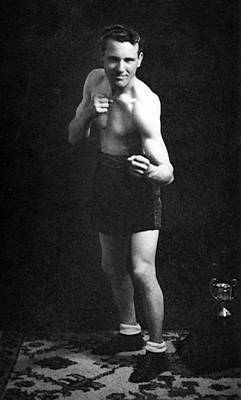 I am trying to find some history on boxing at the Star and Garter where my grandfather, Harold Puzey, boxed in the years between 1925- 1945. I would also like some photos of him in the boxing ring. He won a cup but was eventually told that he couldn't go professional because he was deaf. That shattered his dreams. Harold Puzey married 'Queenie' Doris Maude Large and in 1946 they adopted a son, Edward Kent. During this time they lived in Windsor Great Park grounds. their son was a chorister at the private Royal Chapel and sang solo for the Queen. Harold worked for over thirty years looking after the cattle in Windsor Great Park as well as undertaking some forestry work. He received the Royal Victorian Medal (silver) from the Queen. He lived in the white cottage just inside the park gates and was also presented with a Coronation medal. Harold was also a skilled gardener and continued to win trophies in his retirement. In later years he moved to Queen Anne's flats where he died. Gilbert Tozer was organist at Windsor Parish Church for just four years in the 1890s before he died of TB in 1897 at the age of just 23. He was an accomplished musician, and much admired and respected by those who knew him. Our article comprises an obituary from Windsor Parish Magazine at the time. A Local Football Team from the 1920s. 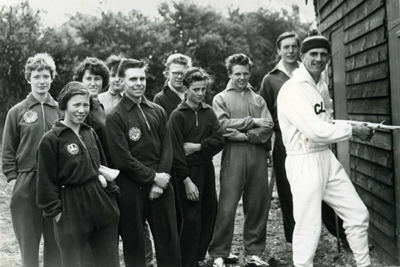 Stan is one of Windsor's most famous athletes from the 1950s through to the 1970s. He also ran a sports shop in St Leonards Road for around 25 years from 1961. He has written a book, A Life on the Run. Walter Veldsman has created a web site for his family history, much of which features Windsor and Clewer from as far back as 1720. His ancestors were residents of Bier Lane, now River Street. In the section, Then and Now, we feature a postcard showing the 2nd Life Guards in St Leonards Road. We are reproducing an enlarged section from the postcard here as the hoarding in front of one of the taller buildings reads E Bampfylde. In the 1901 Census, Edward Bampfylde is listed, aged 49, born in Dunreton, Somersetshire. In 1901 he is listed as a resident in New Windsor, Berkshire. His occupation is shown as 'Builder'. Shown below are his premises. His family included three daughters (we assume) Maria Bampfylde, aged 24, Builders Clerk, Jessie Bampfylde, aged 21, and Nina Bampfylde, aged 8. His wife was Sarah Bampfylde, aged 50, born in London at St Pancras. In Kelly's Directory of Windsor dated 1934 there appears the following advertisement. In 1934 his entry is listed at 21 & 23 Frances Road and reads: 'E Bampfylde, F.I.O.B. Assoc. San. Inst. builder and decorator; central heating, hot water installations & sanitary work estimated for. Tel. Windsor 56. See advert.' 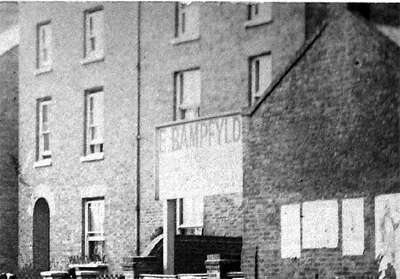 In an advert from the 1950s Bampfylde Builders states that the company was founded in 1877. I was interested to read the piece about Edward Bampfylde on your website and can give you a little more information about him. Edward Bampfylde was born in Dunkerton, Somerset in 1852, the son of Charles and his first wife Jemima Bampfylde and cousin to my G. Grandfather (also Edward) who lived with them. Charles was the engineer in charge of the pumping station on the Somersetshire Coal Canal. Edward moved to Windsor around 1870. He was apprenticed to George Griggs Smith, a house decorator. In 1845 Edward's uncle had married George's daughter Sarah Ann Smith. The 1881 census shows that Edward was living at 1 Argyle Villas, New Windsor with his wife Sarah and two daughters, Maria and Christina (Jessie). He gives his occupation as Master Decorator. George and Sylvia Smith lived next door at 2 Argyle Villas and by 1891 Edward had moved to 23 Frances Road where he had his building firm 'E Bampfylde'. In 1893 Edward's third daughter, Nina, was born. The 1911 census gives Edward's occupation as house builder with daughter Nina then 18, working in her father's office. Both Maria and Jessie had married. Nina married Henry Halliday in 1912. Edward was also an Alderman, JP and Honorary Officer for the Windsor Fire Service. Regarding the spelling of the surname, Edward's father Charles was actually born Charles Bamfield but began spelling his name Bampfylde around 1850. His 2 brothers kept to the original spelling. Additional information is available for a small fee from this site at the National Archives - 1901 Census. Patrick and Julia Canniff lived at 32 Bexley Street at the end of the 1800s having moved to Windsor in 1885 soon after their marriage. Patrick was a tailor and cutter and it is said that he made the Guards uniforms for Windsor Castle and the school uniforms for Eton College. 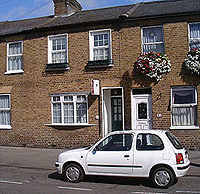 The family lived at 32 Bexley Street, Windsor. During my research at the Windsor Library I also noted Patrick's address as being in St. Leonard's Road. According to a fellow researcher 63/63a St. Leonard's Road used to be a tailors' around 1900-1915. This could have been my great grandfather's business! The researcher mentioned that her great grandmother (Lucket(t) or Barlow), apparently worked there, but she could not find any records. I would appreciate any information on the tailors of St. Leonard's Road. I was also told by my grand aunts, that some of them did the monograms on the Windsor Castle linens, a tradition that continued in our family. They also had a very neat way of folding socks, allowing one to just slip into them, a tradition I use to this day. All the Canniff family are on the 1901 census for Bexley Street. Grandfather's younger brother Ernest actually worked for Buckingham Palace, I am assuming he was a tailor and cutter as well. His son Jim is alive and well and living in Scotland. He remembers being evacuated to Windsor with all the other children during the war. My great greatgrandmother Margaret (a tailoress) and her two other sons, according to the census, lived in St. James, London. 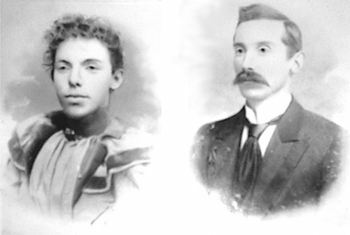 It was just Julia and Patrick that moved to Windsor after they were married at Our Lady of the Rosary, Marlylebone Road in 1885. The picture of them above was taken on glass plates. Fortunately, I made copies of them, before Julia's glass plate fell off the mantel ending up in pieces. My sister Julia has the only remaining one of Patrick. Kelly's directory of Windsor 1899 lists Canniff, James, tailor's cutter, 3 Lamorna Villas, Frances Road. The house is pictured below, painted cream, and is numbered now No. 9. The terrace name of Lamorna Villas is no longer obviously displayed. Incidentally Lamorna is the name of a small and comparatively insignificant cove beyond Penzance in Cornwall, not far from Lands End in the farthest west of England, and doubtless involved in smuggling in years gone by, When it came to naming Lamorna Villas, I suspect the influence of a Cornishman! I would like some information on the Home Guard in Windsor with particular info on a William Frederick Crosson. The interest in the Home Guard is due to the fact William Crosson was a relation of mine and I know he lived in College Crescent Windsor for a number of years.I also know that he was in the Home Guard during the War. What I would like to try and obtain are some photos of him during this period and any info about his duties in the Home Guard. I am a Windsorian myself having lived in the Windsor area for 52 years. We recently came across a photograph of George Tuck and have included it here. We are grateful for a photograph of Frederik Dyson and have included it here. Benjamin Baud was for 14 years an assistant architect to Sir Jeffrey Wyatville and assisted with the alterations to Windsor Castle from 1826 to 1840. We are planning to include a selection of engravings from the book 'Architectural Illustrations of Windsor Castle' [R A Sprigg, Bloomsbury, 1842. Folio] by Michael Gandy and Benjamin Baud which describe the extensive modifications made in the 1820s to Windsor Castle by Sir Jeffrey Wyatville [d. February 1840]. My great great great grandparents were coal merchants around the 1880s in Windsor. They are recorded in the 1881 Census at Nursery Road, which we cannot find. Does anyone know what became of the road? The only other reference we have is Eliza Puddle, Nursery Road, Windsor, Coal Merchant. Also, does anyone have any information about the 'Dell' family and their coal business, in the 1700s and 1800s. Hello, my great-great grandparents, John & Mary Simmonds, lived at 7 Queen Street in 1830. I believe that Queen Street is now Market Street. As the Three Tuns Pub is 8 Market Street. I wonder if the house next door could have belonged to my great-great grandparents. John Simmonds was a post-boy at The White Hart Hotel [now known as Ye Harte and Garter) He was born in Hackney, but I cannot find anything about Mary who was born about 1805. She appears on census records but place of birth is listed as Unknown. They had their first child, Charles, in 1830 in Windsor and in around 1832 they moved to Bagshot, Surrey. Any info greatly appreciated. Please contact S. Jones. North Wales. Certainly Market Street was known as Queen St for a short time between around 1811 and 1829. It was formerly Butchers Row and The Shambles. These two dates reflect contemporary references to the street. There would have been an overlap in old and new naming conventions and usage, of course. Quartermain, Joseph, is listed in the 1881 Electoral Role as living at 52, Victoria Cottages. In the 1950s another Joe Quartermain, perhaps of the same family, was a well-known figure in Windsor, removing furniture piled impossibly high on his barrow that he briskly pushed in his plimsoled feet. He was regularly to be seen in Vansittart Road Recreation Ground beating carpets by hand. He was a great Chelsea supporter (football) and was once credited with walking to Stamford Bridge and arriving before the coach from Windsor. His barrow was the costermonger variety with two large wheels in the centre upon which the load was balanced. We are hoping to find a picture of Joe who can truly be called a Windsor character. T. E. Cochrane was a one time photographer and post card printer/publisher in Windsor. Many of the cards that he published featured his business and, presumably, home address as 27 Queens Road, Windsor but we also have an example of postcards that feature the address 28, St Leonards Avenue. His business is believed to have been in operation in Edwardian times. A number of his cards have been featured on the Royal Windsor Website and an article about him is planned. Many of his photographs seem to be primarily of a military nature, such as soldiers marching through the town or other events where crowds would gather, quite possibly as this would lead to extra sales to the townspeople and soldiers who featured in his pictures. Information about additional Cochrane photographs and postcards of Windsor would be welcomed, either to buy or to copy and make available on the RWWS. Many of his cards feature either his address in Queens Road, or St Leonards Avenue, or are marked TC, often with a number, written on the front. We are currently unsure which address came first. The photographs that we have found to date and know to be his work are listed below. The number in brackets is handwritten on the image negative alongside the title. Certain images are reproduced elsewhere on the RWWS and are linked to from this list. More photographs will be included as time permits. View note: Crowds of Eton Boys and soldiers in the road outside the hall presumably on the occasion of its opening. View note: 1908 or before, featuring an Ascot Landau with Edward VII riding to Royal Ascot races. We have seen a selection of photographs and postcards, marked 'JR' or 'J Roberts', of views and events in Windsor in the early 1900s. Along with T E Cochrane above, we plan to research his activity in Windsor. Stan Mew died in March 2003. A popular regular at The Bexley Arms, Stan was a member of the crew of Challenger II when, in 1951, the deepest known area of the ocean anywhere in the world was discovered. The discovery, still known as the Challenger Deep, was located in the Pacific Ocean, off the island of Guam at the southern end of the Mariana Trench. It is 35,838 feet deep, 10,924 metres. If you could put Everest in it, there would still be a mile of water above the mountain! Stan described how the crew would pay out weighted piano wire over the side of the Challenger until it touched bottom, then they would log the depth, cut the piano wire and move on to survey the next area. It took around one and a half hours for the bottom to be detected. During this tour of duty, Stan was away from the UK for three years and his ship covered 70,000 miles. Before his retirement Stan worked at Windsor Hospital. He had a keen interest in local history and took the opportunity to photograph a panorama of the Windsor skyline from the roof top balcony of the hospital. We are pleased to feature the panorama on The Royal Windsor Web Site. View Stan's panorama. Hi! My name is Lynn and I am trying to trace Thomas Groves who apparently used to be a fireman at Windsor Castle. I know that he had a son called Henry, born 1834. All I know is his name and that Eton comes in somewhere. Would greatly appreciate any information about firemen at Windsor Castle. Looking for the EAGLES family, New Windsor from about 1770 or so. I have a William EAGLES married Maria ??? They had one son (William EAGLES born 1798, a carpenter, m. Mary Bantin) but there could be other children. 2. James, born 1832 (this is my line). He moved to Carshalton, Surrey . 5. Lucy Louisa EAGLES, born 1837. Married 1863 in Lambeth. I have this line. I am not having much luck in find anything on any of them from New Windsor. I live in New Zealand and am hoping to come to England in 2004 and would love to know more about my family before I come over, so any help would be good! For a long time I have wanted to find an RAF friend from WW2, his name Cyril (Sid) Elvy. I spent a few of my weekend passes at 'The Wellington' pub in Peascod St when his Dad was landlord. The pub was taken over by Sid after his father died. Not too long after, Sid and his wife, Lil, with their son Arthur went to a pub called 'The Risiing Sun' not very far away. My wife and I visited them there just after the war when another little Elvy had arrived. Somehow unfortunately we lost track. Sid had one or two sisters living in Slough whom we visited but have no idea where that would be now. I realise it is about 55 years ago and cannot expect much now, as I was under age in the services I guess I beat some of the guys but any info would be very welcome. My father's family lived in the Windsor area between the 1890s (if not before) and the 1950s. Dad's name was Charles Barnett (like his father), and the family of three girls and four boys lived in Alma Road and, later, East Crescent. Charles Senior, whose father Harry had worked at the Royal Mews, married Margaret Fellows nee Winchcombe about the end of WWI. I believe my father and his siblings went to Royal Free School. Would any Windsor people have any memories or information to add to the small amount that I have? Living in New Zealand makes research rather hard! Billy Wilkins - Flag Pole Bee's Waxer! We have created a story on its own about Billy Wilkins. Both Rosie (from Australia) and Carole (from Canada) have provided stories about their school days in Windsor. 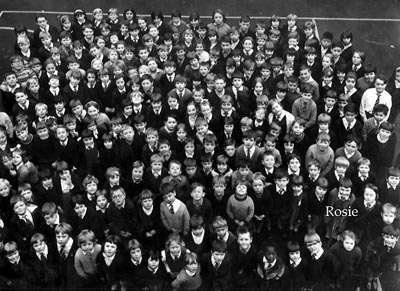 Rosie writes: "I wonder if you recognise yourself in the following photograph? There is a page about the school on this website with snaps of St Stephens school, where of course my photo is from". Carole writes: "I would like to let you know how thrilled and delighted I was to come across the Royal Windsor Web Site. I was particularly interested in the CLEWER ST. STEPHENS PRIMARY SCHOOL article by Rosie Burnett. I also attended St. Stephen's in the 60's and remember my time spent there as if it was yesterday." I am trying to find some detailed history and pictures if possible, about Lady Victoria Wainwright, who lived in or around Windsor and married, Godfrey Howard-Wroughton. (I believe there is a connection with a Fleming House / or Farm. which may be where they lived). According to my friend she had 3 children, 2 boys and a girl. She died around 1846 and I understand that she and her husband are laid to rest in a vault, in the estate church. 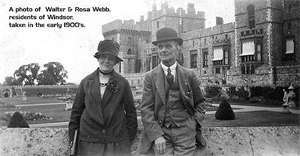 Walter and Rosa Webb, residents of Windsor, taken in the early 1900's by The East Terrace at Windsor Castle. If anyone has any information about them, or the Webb surname in Windsor, do please let me know. For some years it was rumoured that Sir Christopher Wren lived for a time at The Old House Hotel by Windsor Bridge. In 2010 it was decided that this suggestion was not based on fact, partly because the house was built too late for Wren to have been a resident. Sir Christopher Wren did however have a connection with Windsor. Wren's father was the Dean of Windsor and in his early years the family lived in the Deanery within the grounds of Windsor Castle. Wren was born in 1632 in East Knoyle, Wiltshire, and first made his mark as a scientist by becoming a Professor of Astronomy at London's Gresham College in 1657. He won his first architectural commission in 1663 for a chapel at Pembroke College, Cambridge and the Sheldon Ian Theatre in Oxford. Appointed Surveyor General by Charles II, he was chosen to design the new St Paul's Cathedral and more than 50 other churches to replace those destroyed by the Great Fire of London. He was knighted in 1672. St Paul's Cathedral was declared complete by Parliament in 1711, 36 years after the original foundation stone was laid when Sir Christopher Wren was 34 years old. He was 79 at its completion. Wren may have been involved in the building and completion of the magnificent Windsor Guildhall. I wonder if you can help me. Some of my ancestors lived on Castle Hill from 1818 to 1827 and I wonder if there are any maps available of the area for that time. I know that there were far more houses on Castle Hill then there are now and quite possibly my ancestors lived in one of those that were demolished around 1828. I am also trying to discover the whereabouts of Isset's Alley in Windsor and the White Horse on Datchet Lane. Any help you could give regarding these queries would be most appreciated. My grandmother's name was Ellen Honan and was born within sight of the castle. My mother's birth name was Nora Phillips, and she was born in Rochester, New York in 1903, the last of 13 children, twelve of whom grew to full adulthood. My mother died in March of 1998 at the age of 95. My grandmother came from Ireland, victims of the famine who somehow made their way to England, where they stayed for several years in Windsor, and then to America, where they flourished. I found your site by pure chance, and am thoroughly enjoying it. What can you tell me or find out about the "Three Tuns Hotel" Market Street, Windsor? I was born there and my grandmother Dorothy Reay was the licencee for many years and before her my maternal great grandmother Annie Alma Minnett was licencee. I would be very interested to find out when my family first became involved with the "Three Tuns". I was told as a girl, that the "Three Tuns" was used as the Guild Hall, before the present building was designed and built by Sir Christopher Wren. So that makes the "Three Tuns" quite a stately old lady. I would be very interested in any information you may be able to give me, and I would also be delighted to help in any way. I will have a look through some of our old photographs. I have included a little about the Guildhall here. The Three Tuns was built in 1518 for the Guild of The Holy Trinity, a charitable and religious institution. It was their new meeting place and was known as Trinity House. The painter Edmund Bristow was born in 1787 and lived at Windsor under the patronage of the Duke of Clarence, who became William IV. Bristow died almost unknown in 1876 at the age of 88. Known for sporting, animal and rustic style paintings. To contact us, email Thamesweb.